Started his career with Norwich City in 2005. He progressed through the ranks at the Canaries and signed his first professional contract in May 2011. During the 2011-12 season, Matt was loaned out to Macclesfield Town. He was then released by Norwich, in June 2012, and signed for Stevenage a month later. He has also represented Northern Ireland at various youth levels. 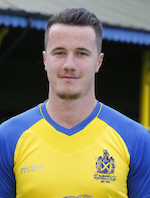 Matt had loan periods at Farnborough and Boreham Wood before signing for Wealdstone for the 2015/2016 season. He signed for the Saints in June 2016. Matt joined Hendon in early January 2017.